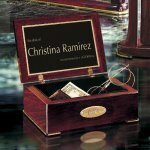 These Jewlery and Keepsake boxes make excellent gifts for birthday's, Christmas or achievement occasions. These items come in a wide variety and range of selections. Simply browse this category for all sorts of gifts and executive gifts. There is something for everyone.